compressors have beenfilled with EmkarateTM RL – moreimportantly this equates to hundreds ofthousands of years of successful fieldoperation. As refrigeration technology movesforward there is an even greater demandfor enhanced lubricant performance andreliability. Uniqema leads the way bycontinuing to invest in synthetic lubricanttechnology in order to meet the demandsof the market and its customers. Subsequent innovations anddevelopments in technology havepermitted improvements to the lubricantformulations and led to the creation of theEmkarateTMRL “H” range ofpolyol esters. 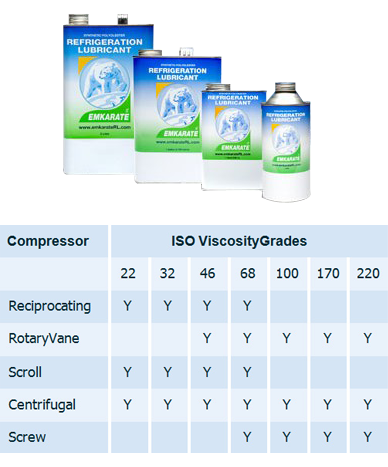 The following table acts as a guide to selection of theappropriate viscosity lubricant for the “H” range. (residential, commercial or transport), EmkarateTM RL is theonly name you need to know. The range of EmkarateTM RL “H” lubricants provides quality,reliability, performance and peace of mind, both for original filloils and during retrofits.